I hate to do it, but I have to tell you this up-front: Save your money for now. Chariot Wars is a racing game mixed with a graphic novel story that tries really hard but ultimately falls short. I tested the game with two separate computers (a macbook without an integrated graphics card, and then an alienware alpha w/2GB DDR5 video card) and while the alienware provided a much better experience overall, the game lacks fine polish. The story behind Chariot Wars is that you’re investigating the murder of one of the charioteers and an unknown woman at the heels of a major festival to celebrate Emperor Hadrian’s 10 years as emperor. While attempting to solve the double murder, you end up replacing the charioteer who was murdered. Now you’re tasked with winning the races and solving the murders. 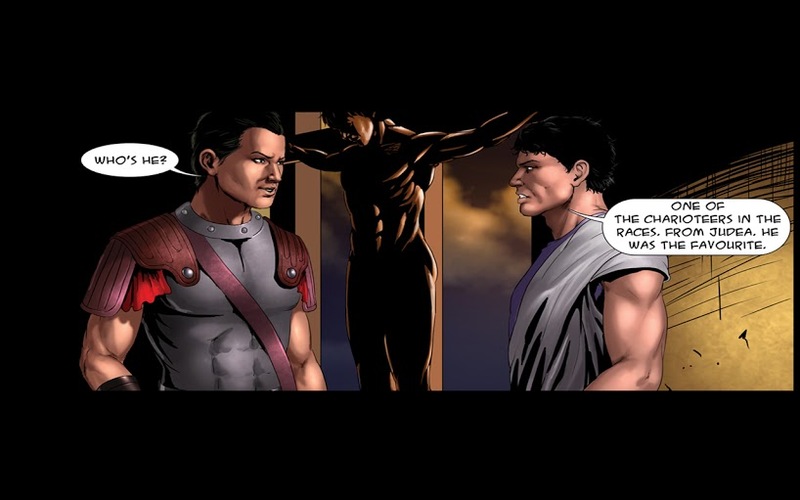 The downfall of this concept is that the story is told to you as a graphic novel in between races. Basically you’ve got a standard racing game and then after each completed race you click through (with an annoying “ping” sound for each click) the graphic novel story. You don’t actually do anything other than read the panels, so it’s a missed opportunity to provide the player with some casual story interaction, even if it’s just to click on a few things in each panel to help progress the story rather than just clicking “next” the whole time. Even some audio samples to reinforce what’s happening in the panels would be nice too. 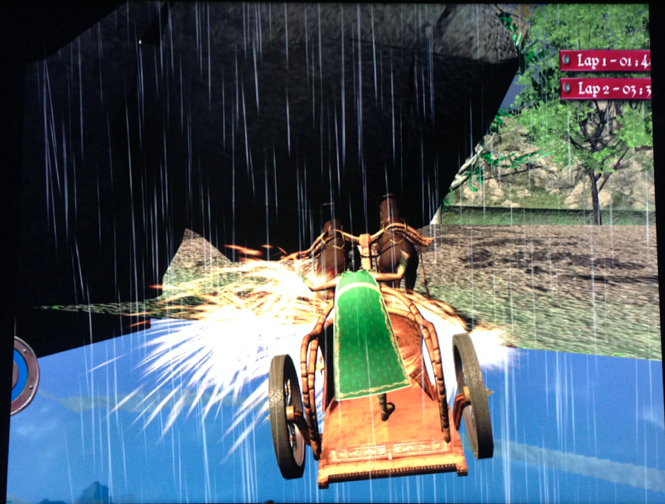 As far as the racing experience, the chariots you drive sometimes load in with the wheels not properly attached to the chariot itself, so while your racing is unaffected, it just looks weird. The animations for the charioteers and horses is pretty basic, and while there is nothing really wrong with that, the repetition will get to you a few races in. The more difficult part of races is that there isn’t a defined Start/Finish on the races, so you just end up with a race win or loss prompt because there aren’t finish lines identified for the races. Theres also no overall race map that would help you identify upcoming twists and turns, and while that’s not really a gamebreaker, it would be helpful because the controls aren’t great. Some of the races have tight turns and via keyboard controls it doesn’t have as much sensitivity for cornering as I’d like. Though it’s easy to find things to pick apart on this game, I would like to say that it does have some good qualities. The races are a good length (usually 2 laps each) and have a nice variety in terms of layout, hills and valleys, and even day/night races. The AI is actually good, almost too good, as they seem to have a giant boost off the initial start of each race. Collision detection needs work, but it seems if you do collide with AI you’re the one who ends up spun out, and then usually blast on past you while you’re still turning around. You upgrade your chariot and horse as you complete races, so you will slowly gain an advantage as you go through the story. I’d love to be able to finish it, but for whatever reason the game refuses to save my progress, so I have had to restart the game several times in an attempt to complete the campaign. There is a multiplayer for the game, but it requires sign-up for a 3rd party gaming site which I opted not to do, so I can’t comment as to how the multiplayer functionality. The GooglePlay version also mentions 4 player multiplayer as well. It’s unfortunate, but this is a bit under-developed for a $24.99 game via Steam. The developer is creating updates and for the game (there was one the night before I started this review), but it needs a good amount of polish before I would recommend the money. That’s a positive for sure, as it does show that there is still hope for this game. At $5-10 I would say it’s an acceptable buy, but that would be pending the multiplayer functionality which I wasn’t able to test. Right now I think you need to keep an eye on the patch updates on steam, and wait until improvements are made. It’s also available for Google Play and iOS too, and while there are a number of negative reviews on GooglePlay, it has over 3,100 5 star reviews, but 1,200 1 star reviews as well. It’s possible it’s just better suited to a mobile platform than a PC platform.